This study investigated steady and unsteady loads acting on a hydrofoil immersed in a turbulent boundary layer. Measurements were performed in a cavitation tunnel in which the hydrofoil was mounted spanwise normal from the test section ceiling, via a 6-component force balance. The turbulent boundary layer was artificially thickened via an array of transverse jets located upstream of the test section. 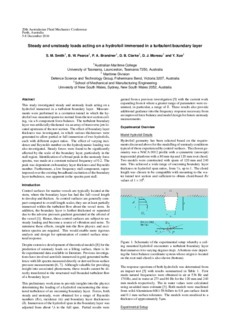 The effect of boundary layer thickness was investigated, in which various thicknesses were generated to allow partial or full immersion of two hydrofoils, each with different aspect ratios. The effect of varying incidence and Reynolds number on the hydrodynamic loading was also investigated. Steady forces were found to be significantly affected by the scale of the boundary layer, particularly in the stall region. Identification of a broad peak in the unsteady force spectra, was made at a constant reduced frequency of 0.2. The peak was dependent on boundary layer thickness and Reynolds number. Furthermore, a low frequency stall component, superimposed over the existing broadband excitation of the boundary layer turbulence, was apparent in the spectra past stall.